Thanks to decades of experience and research, we now know several things about so-called anti-money laundering (AML) laws. They don’t reduce crime or discourage bad behavior. They require banks to spy on innocent people and report their transactions. They impose heavy costs on the financial sector and boost prices on consumers. They disproportionately hurt poor people and poor countries. It’s not that the theory behind these laws is without merit. The original notion was that perhaps we could reduce crime by figuring out ways to prevent crooks from utilizing the banking system. That’s a worthy goal. But it turns out that it doesn’t work. For all intents and purposes, AML laws are a misallocation of law-enforcement resources. So you would think that policy makers would be endeavoring to repeal these counterproductive rules and regulations, right? But you would be wrong. Some of them actually want to double down on failure. To be more specific, four senators have introduced a bill to make these laws more intrusive and onerous. Senate Judiciary Committee Chairman Chuck Grassley and Ranking Member Dianne Feinstein, along with Senators John Cornyn and Sheldon Whitehouse, today introduced legislation that modernizes and strengthens criminal laws against money laundering – a critical source of funding for terrorist organizations, drug cartels and other organized crime syndicates. The Combating Money Laundering, Terrorist Financing, and Counterfeiting Act of 2017 updates criminal money laundering and counterfeiting statutes, and promotes transparency in the U.S. financial system. It’s quite possible that these politicians actually think this new law will somehow reduce all the bad things they put in the bill’s title (I’m surprised they didn’t add tooth decay and cancer to the list). But if past experience is any guide, the real-world result will be more abuse of law-abiding citizens. Writing for the Blaze, Justin Haskins warns how the new legislation can endanger innocent people. Four U.S. senators have proposed legislation that would significantly expand the power of the federal government to seize citizens’ money when traveling in or out of the United States. …several troubling provisions in the law could put law-abiding American citizens at risk of losing tens of thousands of dollars for doing nothing more than failing to fill out a government form. Under current federal law, travelers transporting $10,000 or more in cash or other monetary instruments are required to report those funds to U.S. Customs and Border Protection. Failure to report funds, even if unintentional, can lead to the seizure of the money and criminal or civil penalties. That approach already produces horrible abuses of innocent people. And imagine what will happen if this new law is enacted. The Combating Money Laundering, Terrorist Financing and Counterfeiting Act would expand “monetary instruments” covered under current law to include “prepaid access devices, stored value cards, digital currencies, and other similar instruments.” This is particularly problematic because digital currencies, such as Bitcoin, are theoretically always transported by the owner of the digital currency account wherever he or she goes, which means digital currency owners with accounts valued at $10,000 or more must always report their funds or risk having them seized. Even more troubling is the law treats all blank checks as though they are financial instruments valued in excess of $10,000 if the checking account contains at least $10,000, which means if a traveler accidently fails to report a blank check floating around in his or her luggage, the account holder could face stiff penalties — even if there is no suspicion of criminal activity. Some of you may be thinking that it’s okay to subject innocent people to abuse if it achieves a very important goal of stopping terrorists. But that’s not happening. In a must-read article for Foreign Affairs, Peter Neumann points out that AML laws are grossly ineffective in the fight against Islamo-fascism. …the war on terrorist financing has failed. Today, there are more terrorist organizations, with more money, than ever before. …Driven by the assumption that terrorism costs money, governments have for years sought to cut off terrorists’ access to the global financial system. They have introduced blacklists, frozen assets, and imposed countless regulations designed to prevent terrorist financing, costing the public and private sectors billions of dollars. And what’s the result of all this expense? …there is no evidence that it has ever thwarted a terrorist campaign. Most attacks require very little money, and terrorists tend to use a wide range of money-transfer and fundraising methods, many of which avoid the international financial system. …Terrorist operations are cheap, and according to a 2015 study by the Norwegian Defense Research Establishment, over 90 percent of the jihadist cells in Europe between 1994 and 2013 were “self-funded,” typically through savings, welfare payments, personal loans, or the proceeds of petty crime. …many jihadists have used their own savings and welfare payments or taken out small loans; others have borrowed money from their friends or family. …Financial tools cannot stop lone attackers from driving cars into crowds. But it has imposed major burdens on innocent parties. …the focus on the financial sector proved ineffective; it has also harmed innocent people and businesses. To address policymakers’ demands, financial institutions have “de-risked” their portfolios, shedding investments and clients that might be linked to terrorist financing. …De-risking, moreover, has resulted in the de facto exclusion of entire countries, mostly poor ones such as Afghanistan and Somalia, from the global financial system. The bank accounts of refugees, charities that operate in regions torn apart by civil war, and even Western citizens with family links to so-called risk countries have been closed. Practically no Western bank now offers cash transfers to Somalia, for example, although 40 percent of the population depends on remittances from abroad. And what is the author’s bottom line? Simply stated, the current system is a failure. Instead of continuing to look for needles in a haystack, governments should overhaul their approach to countering terrorist funding… Otherwise, they will waste time and money on a strategy that cannot deliver security for many more years to come. .. Policymakers need to acknowledge that the war on terrorist financing, as it has been conducted since 2001, has often been costly and counterproductive, harming innocent people and companies without significantly constraining terrorist groups’ ability to operate. 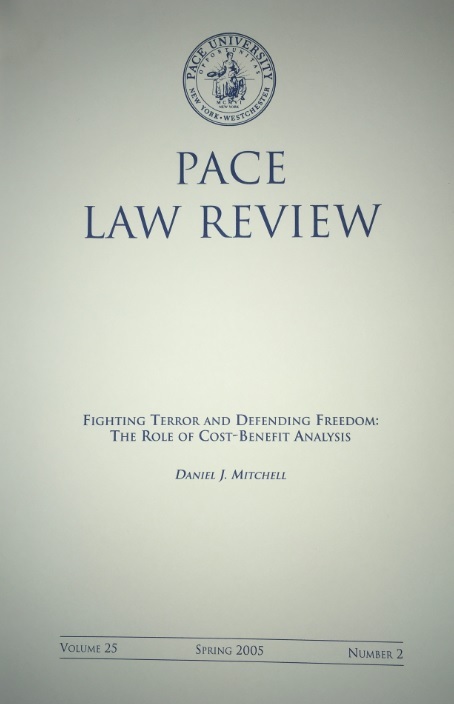 Indeed, I wrote an article for Pace Law Review, published back in 2005, that made many of the same points, including a lot of attention on theoretical role of cost-benefit analysis. Law enforcement policy should include cost/benefit analysis so that resources are best allocated to protect life, liberty, and property. This should not be a controversial proposition. Cost-benefit analysis…already is part of the public policy process. For instance, few people would think it is acceptable for a city of 10 million to have just one police officer. Yet it is also true that few would want that city to have five million police officers. In other words, there is a point where additional law enforcement expenditures – both public and private – exceed the likely benefits. Every government makes such decisions. Cost-benefit analysis applies to aggregate resource allocation choices, such as how many police officers to employ in a city, but also to how a given level of resources are utilized. In other words, since there are not unlimited resources, it makes sense to allocate those resources in ways that yield the greatest benefit. On a practical level, city officials must decide how many officers to put on each shift, how many officers to assign to different neighborhoods, and how many officers to allocate to each type of crime. The same issues apply in the war against terrorism. Officials must decide not only on the level of resources devoted to fighting terrorism, but they also must make allocation decisions between, say, human intelligence and electronic surveillance. Now let’s shift from theory to evidence. I argued AML laws didn’t pass the test. …while anti-money laundering laws theoretically help the war against terror, this does not mean that they necessarily are justified by cost-benefit analysis. A…book from the Institute for International Economics…strongly supports anti-money laundering laws and advocates their expansion. But the authors admit that these laws imposed costs of $7 billion in 2003, yet they admitted that, “While the number of suspicious activity reports filed has risen rapidly in recent years…total seizures and forfeitures amount to an extremely small sum (approximately $700 million annually in the United States) when compared with the crude estimates of the total amounts laundered. Moreover, there has not been an increase in the number of federal convictions for money laundering.” The private sector bears most of the cost of anti-money laundering laws, but the authors also note that, “Budgetary costs for AML laws have tripled in the last 20 years for prevention and quadrupled for enforcement.” The key question, of course, is whether these costs are matched by concomitant benefits. The answer almost certainly is no. …the government seizes very little dirty money. There are only about 2,000 convictions for federal money laundering offenses each year, and that number falls by more than 50 percent not counting cases where money laundering was an add-on charge to another offense. Let’s close with passages from a couple of additional articles. First, Richard Rahn explains why all anti-money laundering laws are misguided in a very recent column for the Washington Times. …what is even more shocking is the extent to which various government organizations monitor and, in many cases, restrict financial freedom, and seize assets without criminal conviction. …The government argues that it must collect financial data and then share it with many domestic and foreign government organizations in order to stop tax evasion, money laundering, drug dealing, other assorted criminality, and terrorist finance — all of which sounds good at first glance, until one looks at what really happens. If you think that the war on drugs has been a failure, look at the war on money laundering, tax evasion and terrorist finance for an even bigger failure. …money laundering is a crime of intent, rather than actions, in which two different people can engage in the same set of financial transactions, but if one has criminal intent he or she can be charged while the other person is home free. Such vague law is both ripe with abuse and difficult to prove. …The financial information that government agencies now routinely collect is widely shared, not only with other domestic government agencies, but increasingly with foreign governments — many of which do not protect individual liberty and other basic rights. And here are some excerpts from a column in Reason by Elizabeth Nolan Brown. American and British banks are monitoring customers’ contraception purchases, DVD-rental frequency, dining-out habits, and more in a misguided attempt to detect human traffickers… Their intrusive and ineffective efforts come at the behest of government agencies, who have been eager to use asset-forfeiture powers… The U.S. and U.K. banks RUSI researchers interviewed said they were happy to help law enforcement prosecute human traffickers and had little problems turning over financial records for people already arrested or under investigation. But proactively finding potential traffickers themselves proved more difficult. As RUSI explains, “the often unremarkable nature of transactions related to” human trafficking made finding criminals or victims via transaction monitoring a time-consuming and unfruitful endeavor. Yet financial institutions are boxed in by regulations that threaten to punish them severely should they participate in the flow of illegally begotten money, however unwittingly. The bind leaves banks and other financial services eager to cast as wide a net as possible, terminating relationships with “suspicious” customers, monitoring the bank accounts of people they know, or turning their records over to law enforcement rather than risk allegations of not doing enough to comply. In other words, these laws are a costly – but ineffective – burden. Which is what I said in this video for the Center for Freedom and Prosperity. P.S. In closing, I should point out that statists frequently demagogue against so-called tax havens for supposedly being hotbeds of dirty money, but take a look at this map put together by the Institute of Governance and you’ll find only one low-tax jurisdiction among the 28 nations listed. Even the State Department’s most recent list of vulnerable jurisdictions shows only a handful of international financial centers. Yes, places Cayman and Bermuda are on the list, but so are countries such as Canada, China, India, Italy, Netherlands, Russia, and the United Kingdom. In other words, it’s basically a random list of jurisdictions rather than a helpful guide. P.P.S. You probably didn’t realize you could make a joke involving money laundering, but here’s one starring President Obama. Defenders of civil liberties have won big victories against gun control in the United States. The fight certainly isn’t over, to be sure, but most Americans have some degree of freedom to own guns, carry guns, and protect themselves with guns. By contrast, the situation in Europe tends to be grim. Many nations strictly limit the freedom of people to keep and bear arms. As you might expect, the “sensible Swiss” are an exception, and nations such as Monaco, Austria, and the Nordics are semi-reasonable. But it’s just about impossible to own a gun in countries such as the United Kingdom, France, Germany, and Italy. Even groups that are targeted by Islamic fanatics, such as Jews, aren’t allowed to defend themselves. And that is good news for terrorists. They can plot murder and mayhem with considerable confidence that they won’t meet armed resistance until police show up (just as mass killers in the USA seek out gun-free zones for their evil attacks). But that passive approach may be changing in some European nations. According to a column in the Washington Post, the President of the Czech Republic believes an armed citizenry is a safe citizenry. A couple of months ago, Czech President Milos Zeman made an unusual request: He urged citizens to arm themselves against a possible “super-Holocaust” carried out by Muslim terrorists. The column notes that he’s almost certainly over-stating the risks. …there are fewer than 4,000 Muslims in this country of 10 million people. But some citizens decided it’s better to be safe than sorry. Now the government is seeking to make it easier for citizens to use those guns for self-defense. …the country’s interior ministry is pushing a constitutional change that would let citizens use guns against terrorists. Proponents say this could save lives if an attack occurs and police are delayed or unable to make their way to the scene. …Parliament must approve the proposal. The good news is that the Czech Republic already has fairly good laws. At least by European standards. The Czech Republic already has some of the most lenient gun policies in Europe. It’s home to about 800,000 registered firearms and 300,000 people with gun licenses. Obtaining a weapon is relatively easy: Residents must be 21, pass a gun knowledge check and have no criminal record. By law, Czechs can use their weapons to protect their property or when in danger, although they need to prove they faced a real threat. Hopefully there are lots of unregistered firearms as well. Though I’m unsure what the Interior Ministry is proposing with regards to gun use against terrorists. Why would the law need to be changed if Czechs already are allowed to use weapons for self-defense? In any event, the bad news is that the meddling bureaucrats in Brussels are trying to make it more difficult for law-abiding people to protect themselves. …much of Europe…has long supported much more stringent gun-control measures. In the wake of the 2015 terror attacks in Paris, France pushed the European Union to enact even tougher policies. The European Commission’s initial proposal called for a complete ban on the sale of weapons like Kalashnikovs or AR-15s that are intended primarily for military use. Ammunition magazines would be limited to 20 rounds or less. …the EU passed a compromise last month… The final measure bans the sale of most military-style rifles and requires all potential buyers to go through a psychological check before they can buy a weapon. …it’s not yet clear if gun owners will have to turn in newly illegal weapons. How typical of the French. They want to make it more difficult for law-abiding people to have guns, an approach that presumably won’t have much – if any – impact on terrorists who presumably can get weapons illegally. And the EU once again ignores its own federalist rhetoric on subsidiarity to push for statist continent-wide policy. Moreover, Kalashnikovs and AR-15s are no more dangerous or deadly than other rifles, so targeting guns that “are intended primarily for military use” is irrelevant nonsense. The bottom line is that more gun control in Europe won’t help the fight against terrorism. Instead, it simply means citizens don’t have the right to defend themselves. So I’m glad the Czechs are trying to do the right thing, in spite of the paternalistic left-wing ideologues elsewhere in Europe. And I hope there will be lots of civil disobedience as more gun control policies emanate from Brussels. P.S. If you enjoy sarcasm, here’s a clever video showing how leftists think about gun control. And here’s another one. P.P.S. If you enjoy when leftists accidentally make the argument against gun control, you’ll enjoy the exploding cigars by Trevor Noah and the New York Times. Whenever there’s a terrorist attack, I automatically feel a combination of anger, horror, and sadness. Like all normal people. But it’s then just a matter of time before I also begin wonder whether we’ll learn that the dirtbag terrorist was financed by welfare. Which is an understandable reaction since that’s now the normal pattern. Over and over and over and over and over again, we learn that taxpayers were supporting these murderous losers while they plotted and planned their mayhem. And it’s not random. They’re actually told by hate-filled Imams to sign up for handouts. And European courts protect terrorist households that use welfare to finance death and destruction. It’s gotten to the point where I even created a special terror wing in the Moocher Hall of Fame. And it’s happened again. The piece of human filth who murdered 22 people at a concert in Manchester was able to finance his terrorism with handouts from the British government. The Telegraph has some of the odious details about tax-financed death and destruction. Salman Abedi is understood to have received thousands of pounds in state funding in the run up to Monday’s atrocity even while he was overseas receiving bomb-making training. Police are investigating Abedi’s finances, including how he paid for frequent trips to Libya where he is thought to have been taught to make bombs at a jihadist training camp. …Abedi’s finances are a major ‘theme’ of the police inquiry amid growing alarm over the ease with which jihadists are able to manipulate Britain’s welfare and student loans system to secure financing. One former detective said jihadists were enrolling on university courses to collect the student loans “often with no intention of turning up”. But he probably accessed other types of benefits as well, particularly since he never worked and had plenty of cash. Time for another example. Remember the piece of human garbage in London who mowed down some innocent people with his car before murdering a policeman? Well, he also was subsidized by taxpayers. Khalid Masood, the radical ISIS terrorist responsible for London’s Westminster terror attack, did not have a job and was receiving government benefits before engaging in his attack. …Masood had a violent criminal history, including several knife attacks. …Terrorists receiving government welfare is a common theme discovered in many post-terror attack investigations. There are also new reports on welfare-subsidized terror from continental Europe. A story in USA Today offers a depressing summary. By the way, I don’t know whether to laugh or cry about the Belgian government’s response. Are they reducing the welfare state? Of course not. But you’ll be happy to know that imprisoned radicals lose access to the government teat. Philippe de Koster, director of Belgium’s agency that fights money laundering and terrorism financing, said steps have since been taken to prevent that from happening again. For example, those convicted of terrorism can no longer receive benefits while in jail. I’ve already written about welfare-subsidized terrorism in the Nordic nations. Here’s another story about developments in Scandinavia. The report examined hundreds of individuals who left to join extremist groups such as Islamic State (IS, formerly ISIS/ISIL) between 2013 and 2016. Commissioned at the request of the Financial Supervisory Authority, it has found that the majority was still receiving living allowance, child benefit, maintenance support and parental benefits while abroad, having other people handle their mail to make it look like they were still at home. The problem seems especially acute in Sweden. Close to every person who left Sweden to fight for terror groups in the Middle East received welfare to support themselves abroad, according to a new government report. A study of 300 Swedish citizens who fought in Syria and Iraq between 2013 and 2016 shows jihadis are getting increasingly good at getting away with welfare fraud. The individuals often use a person in Sweden to handle paperwork and create the illusion that they’re still in the country. …The most attractive option are government loans to study abroad. The loans are easy to get and thousands of dollars are paid out at once. …The Danish Security and Intelligence Service (PET) recently identified several cases of Danish citizens receiving early pension because they were deemed too sick or disabled to work. They later left the country to fight for Islamic State while the payments continue to get deposited into their accounts. …PET has tried to cut off the benefits since 2014, but current legislation doesn’t allow the payment agency to cut early pensions simply because the recipient is believed to be a terrorist. Let’s close with something that it either astounding or depressing, or actually both. All of the examples cited above are nations with bloated welfare states. Governments in all those countries consume more than 40 percent of economic output, and more than 50 percent of GDP in some cases. To me, this is a reminder that the natural incompetence of government becomes worse the bigger it gets. P.S. Today’s column mocks European government for welfare-subsidized terrorism, but American readers should be careful about throwing stones in glass houses. The dirtbags who bombed the Boston Marathon were mooching off taxpayers. P.P.S. I suppose a concluding caveat would be appropriate. I’m not making an argument that welfare causes terrorism. 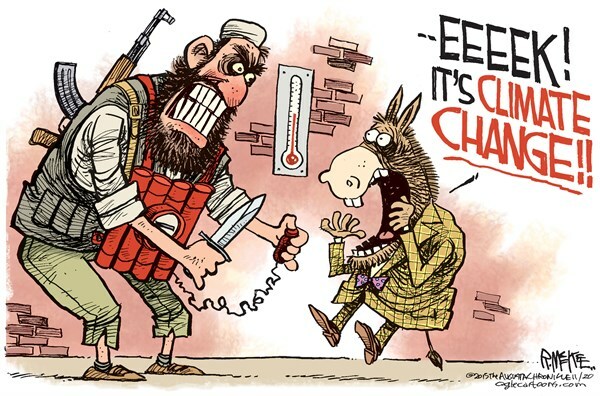 That almost would be as silly as the leftists who claim that terrorism is caused by inequality or climate change. Though I do wonder whether people who get government handouts feel a sense of self-loathing that leaves them vulnerable to jihadist ideology. Whenever mass shootings occur, some people quickly jump to conclusions before there’s any evidence. Folks on the right are occasionally guilty of immediately assuming Islamic terrorism, which is somewhat understandable. Folks on the left, meanwhile, are sometimes guilty of instinctively assuming Tea Party-inspired violence (I’m not joking). I confess that I’m prone to do something similar. Whenever there is a terrorist attack, I automatically wonder if we’ll find out welfare payments and other goodies from the government helped subsidize the evil actions. In my defense, there’s a reason I think this way. Whether we’re talking about Jihadi John or the Tsarnaev brothers, there are lots of examples of dirtbag terrorists getting handouts from taxpayers. It happens a lot in other nations. And it’s now happening with disturbing frequency in the United States. It’s even gotten to the point where I’ve created a special terror wing in the Moocher Hall of Fame. And, as more evidence accumulates, the medieval savage who drove a truck through a Christmas market in Germany may be eligible for membership. Here’s some of what we know, as reported by the Daily Caller. Berlin truck attack terrorist Anis Amri used several different identities to claim multiple welfare checks simultaneously in different cities around Germany. Amri, the Tunisian refugee who killed 12 and injured 48 at a Christmas market in Berlin Dec. 19… The investigation was closed in November because Amri’s whereabouts were unknown. …Welfare is a common way for terrorists to fund their activities in Europe. The U.K.-based Express reveals that the terrorist was very proficient at ripping off taxpayers before deciding to kill them. Despite being shot dead in Italy just days after the attack, the Tunisian refugee is now under investigation for fraud after conning German authorities into handing over cash to fund his terror exploits. After travelling from Tunisia to Europe in 2011, he used up to eight different aliases and several different nationalities – at times even claiming to be from Egypt or Lebanon. Reports claim Amri carried several different false identity documents and used aliases to collect welfare in cities across Germany. The story also has details on how welfare payments subsidized previous terrorist actions. 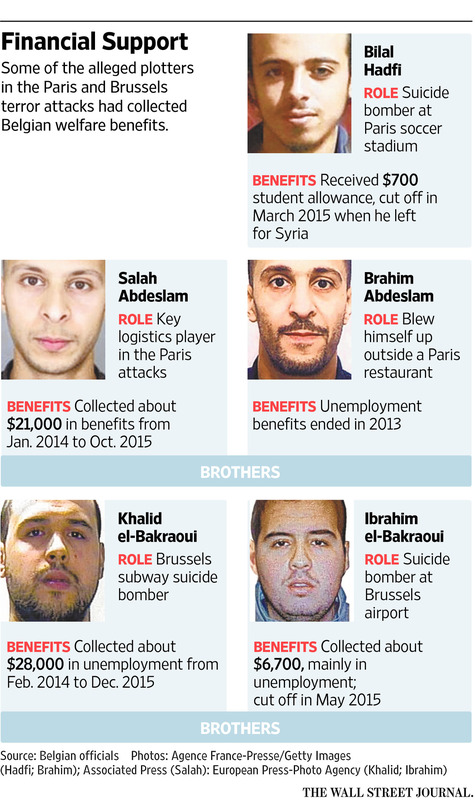 Welfare fraud was key to funding terror attacks in Brussels in March and in Paris last year. Terrorists collected around £45,000 in benefits which they used to pay for the brutal attacks in the major European cities. …Meanwhile, Danish authorities came under fire recently after it emerged 36 Islamic State fighters continued to receive benefits for months after leaving the country to join other members of the brutal regime in Syria and Iraq. And while I’m not sure RT is a legitimate news source, it says Amri used 14 identities for mooching. Anis Amri, the Tunisian man accused of driving a truck into a crowd of Christmas market shoppers in Berlin, used at least 14 different identities, a German police chief said. …Among other things, this allowed the man to receive social benefits under different names in different municipalities, the police chief said. A close associate (and suspected co-conspirator) of Amri also was mooching off the system according to news reports. A spokeswoman for the office of Germany’s chief prosecutor on Wednesday said authorities have taken a second Tunisian suspect into custody following raids in Berlin on Tuesday. …However, she added that there was insufficient evidence to charge the suspect. In a separate statement, the federal prosecutor’s office announced the man had been charged with committing social welfare fraud and would remain in custody. …the suspect had previously been detained on suspicion of supplying explosives intended for a prospective attack in Dusseldorf. …The 26-year-old suspect allegedly had dinner with Amri at a restaurant the night before the attack, according to Köhler. The suspect allegedly met Amri in late 2015. “Süddeutsche Zeitung” reported that the two men traveled together from Italy to Germany that year. Gee, sounds like a model citizen. Merkel must be proud of her caring and sharing welfare state. Last but not least, a story in the U.K.-based Telegraph has some added details on the sordid history of welfare-funded terrorism in Europe. The jihadists suspected of carrying out the bomb and gun attacks in Paris and Brussels used British benefits payments to fund international terrorism, a court has heard. …Zakaria Bouffassil, 26, from Birmingham is accused of handing over the cash which had been withdrawn from the bank account of Anouar Haddouchi, a Belgian national, who had been claiming benefits while living in the West Midlands with his wife. Kingston Crown Court heard how thousands of pounds of taxpayers’ money continued to be paid into Haddouchi’s bank account, even after he had left Britain for Syria and had begun fighting for Islamic State in Iraq and Levant (Isil). …On the opening day of their trial, jurors heard how some of the most notorious and wanted terrorists in Europe had used British taxpayers’ money to fund their activities in Syria and elsewhere. Though I suppose I shouldn’t say “sordid history.” This is more like societal suicide. After all, we’re not talking about welfare payments for a tiny fraction of terrorists. It really is a theme. I linked to some examples above, and if you want more evidence, click here, here, here, here, and here. By the way, I’m not claiming that welfare causes terrorism. Though I do wonder if Mickey Kaus has a point when he does make that link. …extreme anti-social terrorist ideologies (radical Islam, in particular) seem to breed in “oppositional” cultures supported by various government welfare benefits. …The social logic is simple: Ethnic differences make it easy for those outside of, for example, French Arab neighborhoods to discriminate against those inside, and easy for those inside to resent the mainstream culture around them. Meanwhile, relatively generous welfare benefits enable those in the ethnic ghetto to stay there, stay unemployed, and seethe. Without government subsidies, they would have to overcome the prejudice against them and integrate into the mainstream working culture. Work, in this sense, is anti-terrorist medicine. I don’t particularly like government-provided welfare of any kind, but I definitely think there should be strict rules against handouts for immigrants. And if that makes them less susceptible to terrorist ideologies, that’s a big fringe benefit. P.S. It goes without saying that politicians aren’t trying to subsidize terrorism. It’s just a byproduct of bad policy. They do, however, explicitly and deliberately subsidize terrorism insurance for big companies. A rather unique example of corporate welfare. When I was young and innocent, I thought that giving welfare handouts to advocates of terrorism was the most perverse and disgusting way to abuse taxpayers. Now that I’m old and jaded, I’ve learned that governments are so masochistically stupid that they routinely give taxpayer-financed goodies directly to the people who actually engage in terrorist attacks. The U.K. government provided lots of handouts to Jihadi John, the ISIS psychopath who likes to sever heads. The French government generously subsidized Mohammed Merah, the thug who executed a little girl. The Danish and Austrian governments give welfare payments that get used to finance ISIS fighters going to Syria. And there are plenty of other examples. So should any of us be surprised to learn that the human scum who planned and executed the recent terror attacks in France and Belgium were mooching off taxpayers as well? The Wall Street Journal has a very disturbing story revealing the degree to which Islamo-terrorists in Europe relied on welfare handouts as they plotted and schemed to brutally murder innocent people. Belgian financial investigators looking into recent terror plots have discovered a disturbing trend: Some of the suspects were collecting welfare benefits until shortly before they carried out their attacks. At least five of the alleged plotters in the Paris and Brussels terror attacks partly financed themselves with payments from Belgium’s generous social-welfare system, authorities have concluded. In total they received more than €50,000, or about $56,000 at today’s rate. The main surviving Paris suspect, Salah Abdeslam, collected unemployment benefits until three weeks before the November attacks—€19,000 in all, according to people familiar with the case. At the time, he was manager and part-owner of a bar, which Belgian officials say should have made him ineligible. Many of the participants in a disrupted Belgian terror plot also had been on the dole, according to the judge who sentenced more than a dozen people in the so-called Verviers cell last month. Unsurprisingly, government officials seem incapable of drawing the right conclusion. Instead, we get navel-gazing exercises. The revelations raise a difficult conundrum for Europe. On one hand, the modern welfare state is a primary tool for combating poverty as well as integrating immigrants. On the other, officials are working hard to find and stop potential sources of revenue for those bent on committing terrorist atrocities. I’m tempted to respond with a word describing the manure of male bovines. Instead, I’ll simply note that the welfare state is a system that subsidizes and exacerbates poverty, while also hindering assimilation. And, as the enemies of modernity have learned, it’s a handy way to finance terrorism. In Belgium, people exiting prison often receive social benefits to help reintegrate into society. This was the case with Khalid el-Bakraoui,who served two years in prison before blowing himself up in the Maelbeek subway station in Brussels in March. Bakraoui was given jobless benefits in early 2014, after a stint in prison for armed robbery and carjacking. In total, he collected about €25,000 in unemployment, medical and other benefits, according to one of the people familiar with the case. He wasn’t shut off until last December, when Belgian authorities issued a warrant for him in connection with the Paris attacks. Sounds like Bakraoui used his handouts to reintegrate into terrorism. Investor’s Business Daily also weighed in on this issue, pointing out that the welfare state in Europe subsidizes terrorists. Belgium’s government has been extremely generous toward its Muslim population. Most of its welfare goes to Muslims, and it even subsidizes their mosques and imams. Many of these young Muslim men who supposedly can’t find gainful employment don’t want to work. Why would they, when welfare checks are normally 70% to 80% of their income? The editorial notes that generous handouts hinder assimilation. Far from being mistreated, Belgian Muslims are one of the most pampered minorities in Western history. Lest it offend its burgeoning Muslim population, Belgium has “de-Christianized” its Christian holidays. The holiday previously known as All Saints Day is now referred to as Autumn Leave, Christmas Vacation is now Winter Vacation, Lenten Vacation is now Rest and Relaxation Leave and Easter is now Spring Vacation… .Heavily subsidized by Belgium’s overgenerous welfare system, North African immigrants have little incentive to integrate. Instead they turn inward, creating Islamic no-go zones divorced from and hostile to Western society. The problem may be especially acute in Belgium, but it’s a problem all across Europe. If those numbers are anywhere close to accurate, the problem of welfare-subsidized terrorism is going to get worse before it gets better. If it ever gets better. By the way, this also is a problem in the United States. The low-life losers who bombed the Boston Marathon got handouts. And the State Department actually has a program that takes “refugees” from countries with terrorism problems and signs them up for government dependency. P.S. The U.K. government has decided that giving welfare to jihadists isn’t enough. It now sometimes hires them and makes them part of the law enforcement bureaucracy. P.P.S. Though that’s not as bad as the Danish government, which persecutes people who fight back against attackers. P.P.P.S. But officials representing the bloated Belgian government surely deserves some sort of prize for claiming that the nation’s government is too small to fight terrorism. Especially when that government is famously incompetent in thwarting obvious terror suspects. P.P.P.P.S. Unsurprisingly, folks in Texas are smarter than Europeans about responding to terror attacks. There are no simple answers to Islamist terrorism, particularly when individual nutjobs are determined to kill a bunch of innocent people. But I know that some answers to the problem are wrong. So when politicians like Hillary Clinton say we should have more gun control, I side with police chiefs who recognize that an armed citizenry is a much more effective approach. Simply stated, we’re dealing with evil people who want to maximize death, so they pick out places where they are less likely to encounter armed resistance. The European response to terrorism is especially insipid. Law-abiding people are disarmed while terrorists have no problems obtaining all the guns they need. Which leads to terrible consequences with tragic regularity. I’m not sure how to categorize this sarcastic look at how Europe responds to a terror attack compared to how Texas responds, but it does make the key point that it’s better to shoot back than die meekly. Consider this the terrorism version of the joke comparing how the governors of Texas and California respond to a coyote attack. Though this is a deadly serious issue, not a joking matter. P.S. If you want some genuine terror-related humor, look at the bottom of this post. P.P.S. And if you want something truly pathetic, look at how statists try to rationalize terrorism. In America’s sprawling intelligence network, costing tens of billions of dollars, who got fired after the 9-11 terror attacks for failing to connect the dots? Who in the military got fired after the Fort Hood terrorist attack for failing to connect the dots? More recently, who in the FBI or Department of Homeland Security got fired after the San Bernardino terrorist attack for failing to connect the dots? And who in the government will get fired after the Orlando terrorist massacre for failing to connect the dots? If you answered “nobody” in response to all these questions, don’t expect special congratulations. Failure in government is both pervasive and without consequences, so any other answer would have required a degree of near-malicious naiveté normally found at Bernie Sanders’ rallies. And there are lots of dots that should have been connected in Orlando. Jim Geraghty of National Review gathered several examples. The Islamic Center was also attended on occasion by Moner Mohammad Abusalha, who is believed to be the first American suicide bomber in Syria. …he was a security guard at the St. Lucie County Courthouse, often manning the metal detectors at the front of the building.Sheriff Ken Mascara said that in 2013 his staff requested Mateen be transferred from the courthouse because he made inflammatory comments. Mateen’s supervisor notified federal agents, after which, the sheriff said, the FBI investigated the guard. A Florida gun store owner says his employees refused to sell to the Orlando nightclub gunman before the attack. The Florida gun store owner noticed several red flags right away — and alerted the FBI. But, there was never an investigation, and Omar Mateen slipped through the cracks. It may turn out, of course, that some of these reports are wrong. But most of them, if not all of them, are presumably accurate. Yet the hordes of paper pushers in the federal government decided that this dirtbag didn’t belong on the no-fly list (though somehow the feds decided an eight-year old cub scout shouldn’t be on planes)?!? And the bureaucrats didn’t think additional investigations of Mateen were warranted given all the above information, which they had before the attack? I realize I’m venting because of my anger at the senseless slaughter. Yes, I admit that even an efficient government isn’t going to be able to stop all terrorism. And maybe our government quietly thwarts many attacks and actually does a lot better job than we realize. But in this case and others, mistakes obviously were made. Shouldn’t there be any consequences for that incompetence? By the way, other governments are equally feckless. If you recall the terrorist bombing of the Brussels Airport, the Belgian government demonstrated unbelievable and near-malignant levels of stupidity. The Daily Caller has some of the disturbing details. Turkey detained one of the Brussels suicide bombers, Ibrahim el-Bakraoui, in June 2015 on charges of being a foreign fighter. …Turkish Prime Minister Tayyip Erdogan said Belgium ignored Turkey’s “warning that this person is a foreign fighter.” …Erdogan said…“We reported the deportation to the Belgian Embassy in Ankara on July 14, 2015, but he was later set free.” …El-Bakraoui, 30, was sentenced to nine years in prison in 2010 for a shootout with police officers. He was released early but subsequently violated his parole and was supposed to be back in prison. Wow, this is like a perfect storm of government incompetence. First, the Belgian government is told the guy is a foreign fighter in Syria. Second, the Belgian government knew he was a bad guy. Third, they let him out of jail early. And fourth, he violated the conditions of his parole but wasn’t thrown back in jail. But I guess we shouldn’t be surprised. After all, this is the same nation where an official claimed that it was difficult to fight terrorism because of “the small size of the Belgian government” even though the public sector in that country consumes a greater share of economic output than it does even in Italy and Sweden. So what’s the moral of the story? There are three. First, the federal government has become such a sprawling and bloated mess that incompetence seems inevitable. And it doesn’t matter whether it’s on purpose or by accident. We have a government that does a bad job, even when we want good performance. Here’s what I wrote back in 2014. There are some legitimate functions of government and I want those to be handled efficiently. But I worry that effective government is increasingly unlikely because politicians are so busy intervening in areas that should be left to families, civil society, and the private sector. Mark Steyn made the same point in a much more amusing fashion. But there’s a second point that needs to be made about the lack of consequences. If nobody is ever fired for mistakes, it’s obviously much harder to get good performance. The success of any organization depends in part on the carrots and sticks that are employed. But in the federal government, there are no sticks. Heck, you can let veterans die by putting them on secret waiting lists and then get awarded bonuses. From the perspective of bureaucrats, this is a win-win situation. If you do something bad, there are no consequences. And if you allow something bad, there are no consequences. For the third and final point, I’m going to partially absolve bureaucrats because some of the problem is the result of politicians misallocating law-enforcement resources. Think of all the money, time, energy and manpower that is squandered for the War on Drugs. Wouldn’t it be better if the crowd in Washington shifted those resources to stopping people who want to kill us? And what about the multi-billion cost of anti-money laundering laws. For all intents and purposes, the government is requiring banks to spy on everybody, which results in a haystack of information, thus making it impossible for law enforcement to find any needles. Call me crazy, I’d rather have law enforcement concentrate on actual criminals. I’m not expecting perfection from Washington. Or even great performance. But it sure would be nice if the government was semi-effective.